Are you doing enough to minimize customer defection, differentiate your company and secure your business’ future? Given the highly competitive market place posed by the ever growing discount pharmacy groups to keep doing what you’ve always done is unlikely to deliver business growth. Surviving in a retail pharmacy market today takes strategic thinking, accurate market intelligence, and solutions that will help you attract more customers, retain their loyalty, and maximize their spend. Provide Support Live Chat software is designed to assist companies to differentiate their business and drive retail performance through providing customers with quality information and advice at the point of purchase. Live chat software is a powerful all-in-one kit of tools which include live chat messenger, real-time visitor monitoring, proactive chat, co-browser, geo-location map, traffic stats analyzer and many more. Live chat does not require a strict commitment to one client from the agent and allows to serve up to 3-4 customers at a time. Live chat offering diverse features, such as co-browser and page push, access to client’s membership details etc., increases the efficiency of the support agent and allows to close the sale faster. Proactive chat feature as well as real-time access to a wide range of information about the customer, such as their referral, search terms, navigation history through your website, the page they are looking at, duration of stay etc., allow the sales agent to target the customer with just the right offer at a right time. Co-browser helps them to navigate the customer through the website pages to demonstrate other related products. 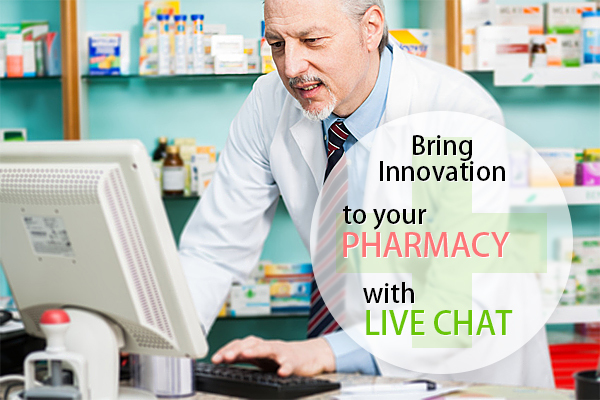 Instant live support helps your pharmacy to build deeper relationships with high-spending patients by providing services and products targeted to their needs, at a time convenient to them. Our traffic analytics tool provides valuable information on your patient demographics, their points of interest on your website, pages they spend the most time on and keywords they use. By analyzing this data you can identify and prioritize areas for improvement, develop new programs and services to meet their needs. Real-time visitor monitoring tool enables your CSRs to spot the customers who are stuck at the checkout process and offer help to them. By providing personalized support tailored to individual situation you will save and convert more leads and earn more return customers to your pharmacy. Quality online support service offered on a website adds credibility and trust, ensures transparency of your business to the public. By making yourself available through live chat you invite your clients’ contact and give them increased confidence in your company. Customers are used to being bombarded by advertisers with multiple sales calls and marketing emails. Change how they see your company, differentiate yourself by putting customers in control and allowing them to choose when and how to initiate a first contact with you. Be available to your patients through live chat and let them see that their convenience and their needs are your primary focus. Ask for their feedback and opinion through offering post chat surveys and let them feel more important and valued. Equipping your website with a modern and effective live support tool allows you to keep pace with time and along with making your pharmacy operations more efficient it also renders your business more relevant in the eyes of the patients, improving your brand image and recognition. Reinforcing your service reps with a powerful customer service tool to increase their efficiency and improve customer experience helps to make your pharmacy more customer oriented. Better service quality leads to better customer satisfaction rates, bigger customer retention and higher sales. Operational excellence is critical in the retail pharmacy business. There’s simply no room for higher overhead due to inefficiencies in your labor force and customer service procedures. Take action now and subscribe to Provide Support’s 10-day free and fully functional trial to experience fast, efficient, effective, secure, affordable and valuable live chat service and start growing your business. This entry was posted in Articles and tagged live chat for pharmacy business, live help for website, live support tool for pharmacies. Bookmark the permalink.